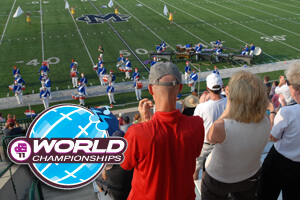 Open Class corps will once again kick off the excitement of the 2011 DCI World Championships in Michigan City, Ind. this August. In a new two-day format, competition gets started on Monday, Aug. 8 with the Open Class Prelims. All participating corps will be featured at this event, with the top 12 advancing to the Finals competition on Tuesday, Aug. 9. General admission tickets for the Prelims cost $15. Reserved center-section seats for the Finals cost $25, with general admission seats available for $15. Tickets are now on sale through the DCI Box Office online or by calling 317.275.1212. Learn more about the Michigan City Open Class Prelims. Learn more about the Michigan City Open Class Finals.